Today, millions of Americans were off from work because of Veterans Day, but I wonder how many really thought about why they were off. Veterans Day is a day to think about those brave few who gave so much for this country. I do this in the way I have since I was a small child, by watching war movies. Nothing says “thank you” to our country’s veterans like watching their exploits dramatized on ...cable television. One of my regrets in life is that I was unable to serve in the military. Unfortunately for me, my family was well off and I really had no option other than college, but I like to think I would have been a great soldier. The American fighting man is the best in the world and we do them a grave disservice when we don’t use them. 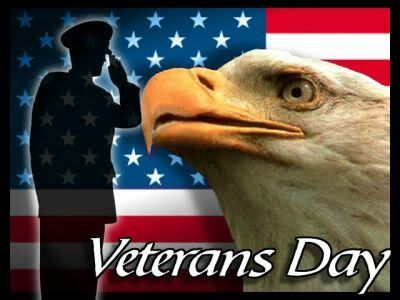 To our veterans who served when their country needed them, I thank you. I am not a soldier, but I have been wounded in our cultural war and I continue to try and fight the good fight. Isn’t that what Veterans Day is all about?